This week at Hand Stamped Sentiments it’s an inspiration challenge. 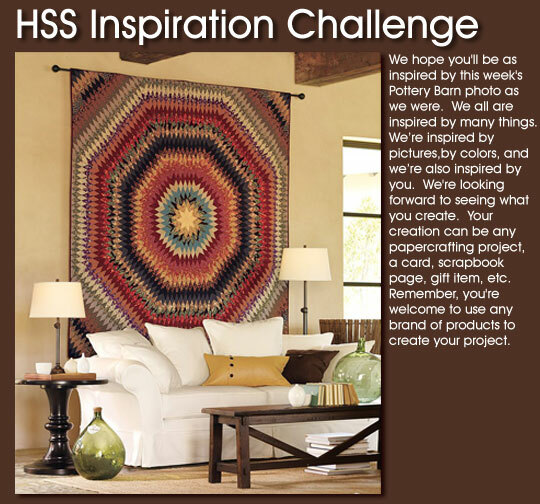 The challenge is to use the photo from Pottery Barn to inspire your project, which can be a card, scrapbook page, gift item, etc. Take the challenge. Submissions are due by noon on Monday, August 16th. I can’t wait to see your projects. Remember you can use any brand of products to create your projects. I really love the sunburst quilt on the wall so I used it as my background paper for the Top Note shape. I printed the full size photo of the quilt on matte photo paper. Click here for full size photo. I then cut out the quilt portion I wanted on my Top Note Die then ran it through the Big Shot. To add dimension and texture I ran the Very Vanilla layer through my Big Shot with the Perfect Details Texture Plate. I then made a scallop flower and secured it with a 3/4″ circle from the background paper and a silver brad from the Hodgepodge set. Click here for the fan fold flower tutorial on Splitcoasters. I adhered the Top Note to the Very Vanilla layer, added the ribbon then adhered the scallop flower with mini-glue dots. That is such a pretty card! How did you make the paper for the top note die? When I enlarge the potterybarn picture it is blurry. I had the same question as Sue-How DID you do that?It looks so cool. Love the fan fold flower. Yet another technique I’ve wanted to try. Great card. Awesome card! Love the fan fold flower. 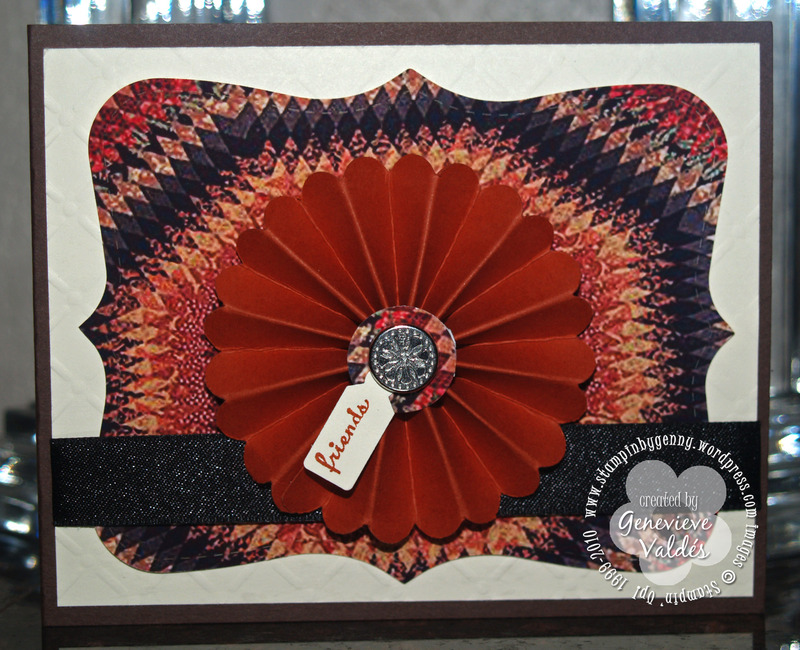 This is a gorgeous, eye-catching card! I will have to give this a try.